One of my favorite blogging groups is the love blog hop group. Each month we pick a theme ingredient and then connect to bloggers all over the world who feature this ingredient in their recipes. I am so excited about the theme of this month’s love blog hop. You would think that this love blog hop would be easy for me, right? Well, here’s the deal. We start every dinner with a plate full of spinach and then we add whatever we are having. Put some spinach on your plate. Now, put your dinner on top of the spinach. Call me crazy, but I don’t think everyone would necessarily consider that a recipe. It took awhile for me to find a recipe that would be based on raw spinach salad AND be clean AND be something that we would actually eat. After looking through cookbooks and recipes online, I turned to one of my favorite resources: The Rodale Whole Foods Cookbook. And the best part? It came with a recipe for a honey mustard vinaigrette. Remember a long time ago, I asked if you would like to see a clean makeover of salad dressings? I got this response from Nadia Riese. The salad dressing that I love the most is honey mustard. I can’t seem to find a healthy, homemade version that I like. Help? Well Nadia, this is for you. I found my cape and an amazing, clean honey mustard vinaigrette. I hope you like it! On low heat, heat the vinegar and honey until the honey is dissolved. In a small jar or tupperware container, add vinegar and honey mixture to oil and Dijon mustard. Shake to combine. Heat oil in frying pan at medium heat. Add mushrooms and chicken sausages. Alternate between covering the frying pan and stirring the mushrooms so the bottom layer does not get overdone. 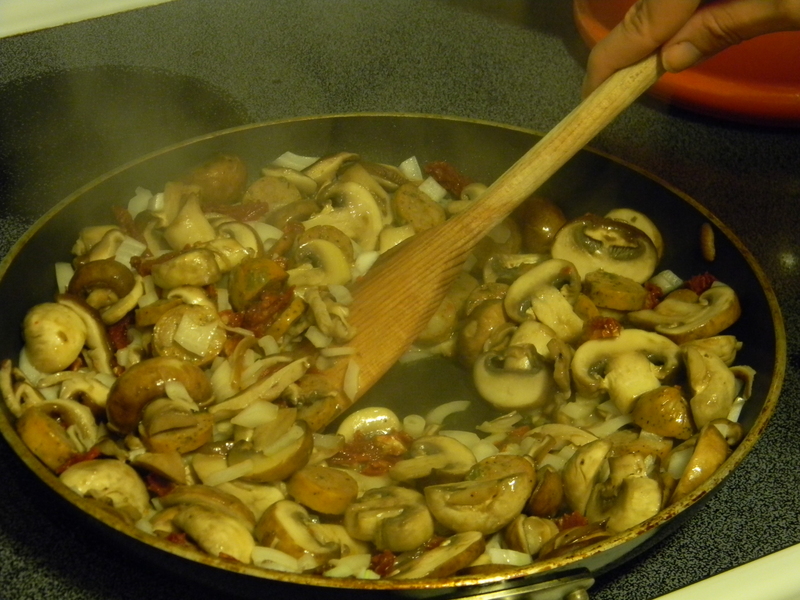 When mushrooms are browned, add diced onion and sun-dried tomatoes. Saute for one minute, stirring constantly. 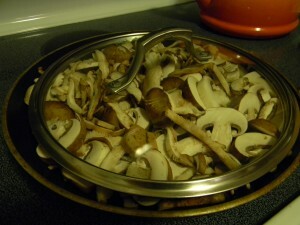 Move mushroom mixture to a large bowl. Toss with lemon juice, salt, and pepper. Serve on top of bed of spinach with toasted walnuts (or croutons) and honey mustard vinaigrette. Recipe Review: This was a dream meal! Yes, we eat all of our meals on top of spinach. Yes, we subsist on salads. So, how is this salad any different? It’s hard to tell. The lemon juice at the end seemed to heighten ALL of the flavors of the mushrooms, sausage, and sun-dried tomatoes. For our version, we used shitake, baby bellas, and white button mushrooms. For chicken sausage, we used Trader Joe’s Italian sausage. Somehow in the combination of all of these flavors, I tasted a bacon, smoky undertone. I’m also embarrassed to admit this but Manatee and I ate it all: 2 pounds of mushrooms and 1 pound of spinach. This should probably serve 4 people, but we just couldn’t stop eating it. And at the end, we didn’t even feel stuffed. The dressing is the perfect balance of sweet and savory. It has all the flavor of a hearty honey mustard but won’t weigh the salad down. 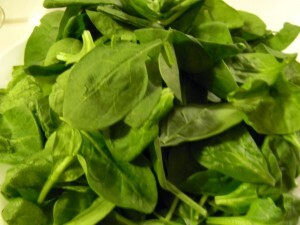 Please join in on the #greenslove fun by linking up any leafy green recipe from the month of March 2012. Don’t forget to link back to this post, so that your readers know to come stop by the #greenslove event! The twitter hashtag is #greenslove :). 240 Comments on "Greenslove! 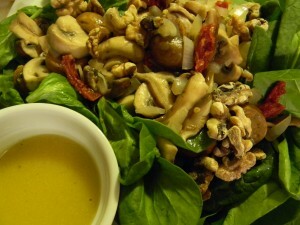 Warm Spinach and Mushroom Salad"
What a great idea for a bloghop–I would love to join in this. I eat a lot of salad, too, and I love this combination of flavors. It looks delicious! Love the idea of sauteed mushrooms and sausage together w/ spinach. 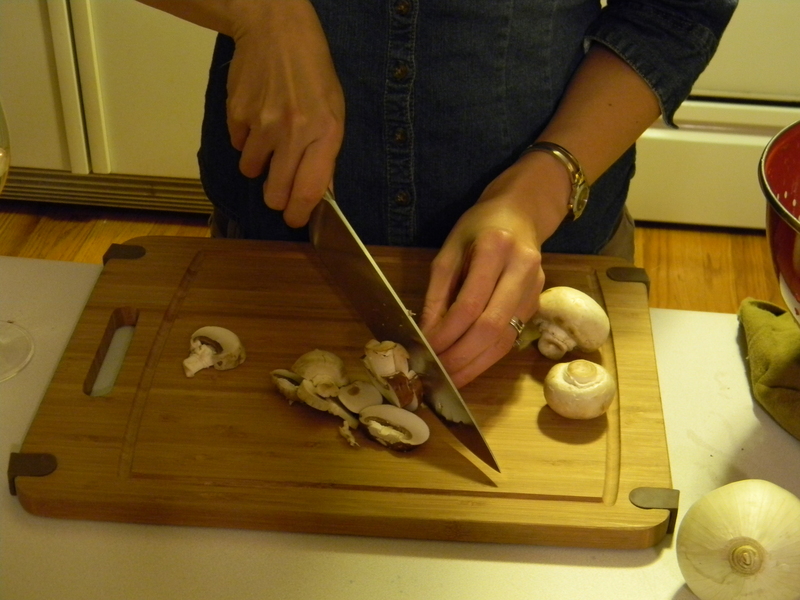 I need to saute mushrooms more…thanks for the inspiration! I love that you add whatever your dinner is to the top of a bed of spinach! What a great way to ensure you have your greens. Of course, this warn spinach salad looks lovely too. It’s wonderful how lemon juice can so effectively heighten flavors. Lots of #greenslove to you! Woah! This looks like a great salad! Really unfortunate I couldn’t join the gang this month. i totally love to top my dinner on top of a bed of spinach too! 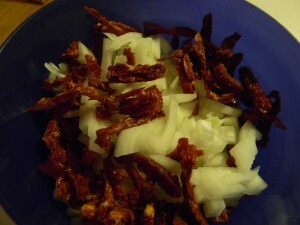 usually mine is caramelized onions :). love the salad dressing! 🙂 have a wonderful week! So healthy your normal spinach dinner plate every night. Glad you made the spinach the start this time with great warm mushrooms and a delish honey mustard dressing. Beautiful creation for greenslove. Mmm, this looks gorgeous! 🙂 I love warm spinach salads, and mushrooms make me happy in any setting. Nice! Wonderful recipe, Kimberly! Beautiful combination of flavors :)Looks deliciously great. Have a lovely week ahead! I love the salad combo you put together! As a kid, there were definitely certain veggies I didn’t like, but for some reason I always loved spinach, especially warm spinach salad. Your recipe just reminded me of that :-). This is definitely going on my #greenslove list to make!! 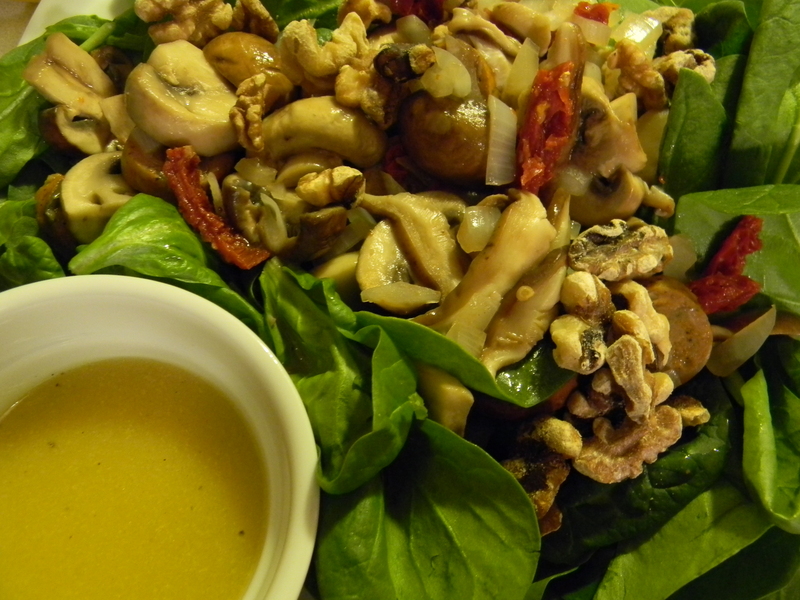 I love wilted spinach salad, but have never had it it with warm mushrooms. Can’t wait to make it. Sending #greenslove your way! Mmm! That salad looks so fantastic – I’m practically drooling! experts of this sector do not understand this. You should continue your writing. Enjoyed examining this, very good stuff, regards. “If it was an overnight success, it was one long, hard, sleepless night.” by Dicky Barrett.